The Stand Cover Case's bold lines and pinstripe suit design exudes confidence that will suit a success-loving individual. The built-in kickstand & military-grade protection are just few examples of Samsung's ability to offer superior innovation & quality. Best case samsung knows what their product needs. Side soft material and hard over layer material special plastic that is not slippery not like the typical one. With kickstand and Samsung's logo, it feels premium. The cover fits perfectly with no loss of control over the buttons. The stand works well and the cover protects the phone from minor knocks and scratches. Love this case.....looks very sharp and the flil out stand is genius. 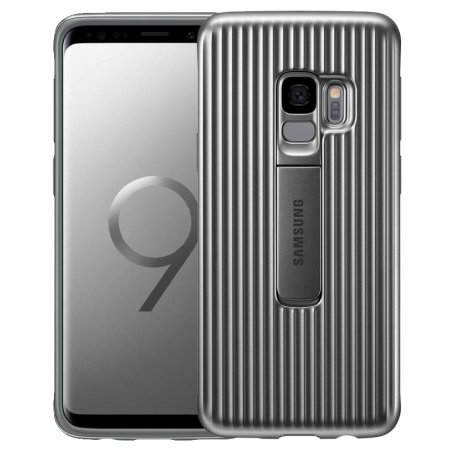 The very best of the official S9 range! 10/10 - loving it! It looks and feels premium, which is what I have been looking for. 9/10 - it is not a tough case or a flip case with one of these built-in covers for the touchscreen, but the protection is genuinely more than adequate. I have not dropped it (yet), but I am sure it could take a beating or two. ?/10 - obviously, it is not as cheap as some of the cases, however, you pay a bit extra for quality, brand, design and packaging, which I am happy about.